Heritage Lime Plaster is our fine finish internal top coat skim. 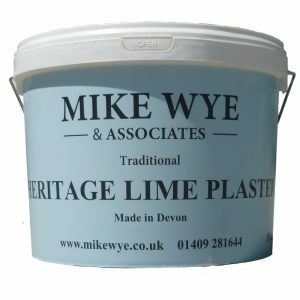 Use Heritage Lime Plaster for general internal lime plastering on to walls and ceilings and also when skimming on to plasterboard. For plasterboard, it will be necessary to first scrim the joints with a thin coat of gypsum to secure the scrim tape. Apply DG27 Primer over the whole surface before lime plastering. Regency Plaster by Mike Wye offers the smoothest of lime plaster finishes. Specifically designed to match the finest historic plaster work. Lime plaster offers advantages over cement based mortars and gypsum plasters for the lime plastering of traditional properties. Vapour permeable: allows the structure to “breathe”. Flexible: can accommodate general movement better. Self-healing: can help to reduce cracking problems. Hygroscopic: ability to absorb moisture which can therefore reduce condensation problems and regulate humidity. As with all lime putty based materials the best outcome requires patience and careful control of drying and suction. The reward for this being an attractive and long lasting plaster. Regency lime plaster is a superior blend of our mature lime putty with fine sands and marble flour. It is suitable for creating exceptionally smooth lime plaster finishes. Pre-coloured Regency is now available from our range based on our 54 stunning limewash colours (see our Limewash Colour Chart).